In the blog category “General Health and Well-Being”, I will focus on the specific health benefits that accrue from the practice of mindfulness meditation. From time to time, I will take brief detours into other areas of health and healing as well. Left – Nov 2011. Right outside the gates of University of Florida in Gainesville, FL. Right – July 2016. At Weight Watchers store in Beaverton, OR with leader Kathy Cunningham. July 12, 2016 was a very significant and momentous day for me. It was on this day that I shed all excess weight of over 26 pounds from my body and achieved my ideal weight after 5 years of continuous effort. On this day, I became a Weight Watchers’ Lifetime Member. On this journey, I learnt much about my own body and mind. In this article I want to list four major activities that helped me enormously in this journey. 1.Mindfulness of feeling tones: Mindfulness of feeling tones is a very powerful application within the broad domain of mindfulness practice. There are three basic components to any emotion that arises within us: i) the thoughts or the stories behind the emotion ii) the physical sensations that reflect how the emotion manifests itself in the body and iii) the emotional mood or feeling tone in the mind. Feeling tones can be pleasant, unpleasant or neutral. It is the feeling tone keeps us hooked into our conditioning behavior of craving and aversion. We like whatever has a pleasant feeling tone, dislike whatever has an unpleasant feeling tone and are unaware of anything that has a neutral feeling tone. Feeling tones can become a linchpin for transformation because our actions are most often based on them rather than on the emotions directly. I used to think that tater tots and grilled cheese sandwiches were mankind’s greatest inventions. I used to get cravings to eat these kinds of food throughout the day. The cravings for such food had a very strong pleasant feeling tones attached to them. Instead of giving in to these cravings, I just stayed with them mindfully. Very soon, they would subside and take the craving away. I was therefore able to ride out these emotions till the time came when they no longer had any hold over me. Cultivating this habit of being mindful towards feeling tones can go a long way in becoming free from any addiction. 2.Mindful Running: I started my weight loss journey in 2012 when I realized that I was unable to keep up with my children as they ran around the house in a perpetual state of playfulness. I would have to lie down on the couch for a few minutes just to catch my breath and to recover from the little time I spent playing with them. I then embarked on a running exercise with the ultimate goal of participating in a formal 5k race. I would practice on my own and started by running a mile and then gradually increased the distance till I was able to run 3 miles. During my practices, I experienced a break-through that made the whole running experience richer. I was under physical stress, my heart was pounding, my legs and sides were hurting. Instead of panicking and having alarming thoughts arising due to the sheer sense of discomfort; from time to time, I would lean into it and accept this experience. This was very similar to leaning in to an unpleasant feeling tone experience and watching it go away by itself. The act of leaning in ended the psychological suffering and I was faced with just the physical suffering that was much easier to manage even as I continued to run. It was also very entertaining for me to observe my mind when I embarked on this practice of 5k run. My mind would fight feverishly to end the physical suffering. During a run once, I saw a maple leaf on the ground. My mind immediately linked the maple leaf to the Canadian flag and then to the fact that Canadian people were very peaceful and therefore I should stop the violent act of running and start being peaceful. I smiled but kept on running. 3.Intermittent Fasting: Having grown up in an austere religion of Jainism in India, I was very much used to the practice of fasting on a regular basis as advocated by its vast religious practices. Today, Intermittent Fasting is an umbrella term for various diets that cycle between a period of fasting and non-fasting. Current studies have shown that fasting turns on autophagy, which is the process by which cells recycle waste material, eliminate or downregulate wasteful processes, and repair themselves. Autophagy is important because it has shown to reduce the negative effects of aging and to reduce the incidence and progression of aging-related diseases. It turns out that short-term or intermittent fasting induces profound neuronal autophagy. Sometime in 2014, I restarted the practice of fasting by not eating any solid foods for a period of 14-18 hours once a month. Initially those fasting days were tough but they became easier and easier to manage. 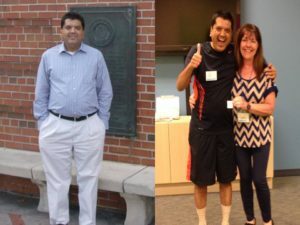 When it came to weight-loss efforts, Intermittent Fasting gave me the capacity to withstand the pangs of desire I had to consume rich, processed foods all the time. All of these efforts were great. They helped me lose weight but I got stalled when I had to lose the last 5 pounds. I got used to my diet and strength training regimen and was in this rut for nearly two years. I desperately needed a breakthrough and it came in the form of CrossFit. 4.CrossFit: CrossFit is a strength and conditioning program consisting of a mix of aerobic exercise, calisthenics and weightlifting. The program comprises of hour-long classes at gyms led by coaches who make sure that participants do the exercises in correct forms and movements. They are present to motivate participants to push themselves beyond their comfort zones. These classes are an amazing experience for me as I usually work out with professional athletes, professional sports people and ex- military personnel. The last time I was engaged in a form of physical activity with such a group of men and women was over 20 years ago. The activity was Spelling Bee. CrossFit made me realize that I was capable of performing so much more physical exercise and effort than what I usually expended. This was the breakthrough that I was seeking. As the level of physical effort increased, I automatically shed the excess weight and was finally able to lose that last 5 pounds. I want to point out that compared to the other people working out with me in my CrossFit classes, I used baby weights. However, the common trait I shared with them was that we were all trying to push our limits of physical endurance and stamina. At the end of the day, our weight is not the only barometer of good health. However, we can leverage it to inculcate habits that lead to our overall sense of good health and well-being. We can then protect the most valuable asset we possess. Creating an overall health maintenance strategy that comprise of diet, exercise and meditation will allow us to add life to our years and years to our life. DISCLAIMER: Please note that I am not a qualified health professional. I am stating certain modalities like intermittent Fasting, CrossFit, etc. and sharing my experience because they have helped me enormously in improving my overall health. Please do your own research and talk with your doctor before starting these practices.